We’ve heard Vidya Balan’s soothing voice in government ads on radio and television since 2012, urging India to end open defecation, exhorting Indians to build toilets in homes and telling us stories of battles being fought across the country in the name of the loo. One such ad had Balan placing the spotlight on a bride fromUttar Pradesh called Priyanka Bharti who left her marital home and returned only when her husband built her a toilet. In the same year, a young woman called Anita Narre from Madhya Pradesh made news for the same reason, refusing to go back to her sasural until her spouse built a toilet in the house with the help of district officials, as recorded by media reports from back then. Toilet: Ek Prem Katha tells us the story of Jaya, a fictional woman just like these two. In text flashing on screen before the end credits, Toilet informs us that it is based on the story of Anita and her husband Shivram. That’s funny though since Anita’s potty revolution took place two years before the Narendra Modi government came to power, yet this film pointedly sets its heroine’s actions in Modi’s time, implies credit to him and is, in fact, an ode to the present prime minister cleverly disguised as an ode to sanitation instead. It is a pity that director Shree Narayan Singh chose to soil his film with pro-government propaganda, because until the Modi spiel sneaks up on us in the second half, Toilet: Ek Prem Katha drives home an important – even if simplistically handled – point. Keshav (Akshay Kumar) and his brother Naru (Divyenndu) run a cycle shop in a village in Uttar Pradesh. At 36, Keshav is single because his accursed kundli can be countered only by a marriage to a buffalo and, if he does subsequently find himself a human bride, she has to be double-thumbed. So, he weds the beast and not long after, falls in love with Jaya (Bhumi Pednekar). She is highly educated, he has just completed school. Her family is modern, his father’s mentality is stuck in the Stone Age. To add to the hurdles in the path of their inevitable union, their relationship starts off on a misunderstanding, as it is with all conventional Hindi film couples. And of course there is the question of her thumb. How many does she have? Never mind how Keshav gets past these problems, but as you already know from the trailer, he does marry her. The big Mahabharat of their lives comes when she discovers, on the morning after her suhaag raat, that her new house does not have a shauchalay and she must walk kilometers in the company of all the village women, to relieve herself in distant fields and foliage. A miserable Jaya decides to leave her husband unless he builds a toilet in their home. Toilet: Ek Prem Katha is about how Keshav, with some help from her, gets rid of this final hurdle in their path. So far so good, if you can get past a very problematic opening half hour and the silliness of a nearly-50-year-old Kumar (his birthday is next month) playing a 36-year-old youth. The age disparity between the hero and the actor playing him is in keeping with a custom followed by generations of senior male Bollywood actors. The film faithfully adheres to two other Hindi film traditions. First, Kumar is 22 years older than Pednekar. Yeah yeah, Jaya mocks Keshav about his age, but such mockery is now a cliché in films headlined by men from Bollywood who are in the vicinity of 50 and insist on acting with women young enough to be their children. Second, Keshav stalks Jaya into falling in love with him, going to the extent of photographing her without her permission and using her picture in posters for his shop, again without her say-so. These scenes are all presented as comedy, which is typical of an Akshay Kumar film. The irony is that just this week Kumar had spoken up about the stalking and attempted abduction of Varnika Kundu by the son of Haryana’s BJP chief, yet Toilet: Ek Prem Katha adopts the same jestful tone towards stalking that Union Minister Babul Supriyo did in the context of Kundu’s case, when he joked about “boy chase girl” scenes in reel and real life. Sad, because Jaya and Keshav are the sort of people who are worthy of a film sans socially reprehensible formulae. And there is so much in this one that works: Kumar’s comic timing is slamdunk impeccable, Pednekar – the sweet debutant from 2015’s Dum Laga Ke Haisha – is truly gifted, and there is both humour and poignancy in their interactions once he is done being a creepy pest (despite the distracting truth that she looks like his daughter). The songs Has mat pagli pyaar ho jayega (in the voices of Sonu Nigam and Shreya Ghosal) and Subha ki train (Sachet Tandon and Parampara Thakur) capture the ache and affection that such a couple might feel. Just as you start rooting for these two though, the film takes the shine off them by rooting for the present government. Shree Narayan Singh has a right to be a fan of Modi, but he has no right to play fast and loose with facts or play political games with the viewer. It begins with Jaya looking at reports about toilet-related corruption scams into which a dialogue is casually snuck in: she tells her granddad that all of them took place four years back (meaning: in 2013, meaning: before the present government came to power). We are then repeatedly told that the lack of toilets in the country is our fault and not the fault of the government. While it is true that many rural folk have a caste-and-religion-related mind block against building toilets within their homes, but can someone please tell me how citizens are to blame, for one, for the lack of clean, safe toilets on highways and in other public places? Anyway, a TV reporter specifically announces that the sarkar has built three million toilets in the past three years. Three years, meaning, since 2014 when the present government was voted in, get it? Who knows anything of the India that existed before that year. I kept waiting for someone to also praise Aadhaar and the implementation of GST, to complete the sucking-up agenda. Small mercy that Toilet stops at its devotion to notebandi. 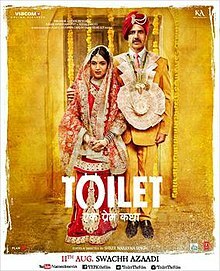 The tragedy of Toilet: Ek Prem Katha is that minus the stalking and the chamchagiri, it could have been a good film. Yes it is simplistic in its take on the prejudices against toilet building in our country, yes it implies that this is a Brahmin-specific – or at least upper-caste-specific – issue, yes it ignores the trauma of Dalits who are forced to clean the faeces of upper castes in both rural and urban areas (highlighted in Divya Bharathi’s recent documentary Kakkoos), yes it lacks the nuance and realism of the lovely Malayalam feature film Manhole by Vidhu Vincent which is about manuel scavengers in our cities, yes it displays a bizarre gender skew when it makes the need for toilets a women’s-only issue (though women are most affected due to the security risk in using fields and other public spaces, hygiene and dignity are human concerns across genders), yes it misses the complexities in women’s reactions to public defecation (studies have shown that some rural women actually prefer that morning walk over privacy because that is the only time their families allow them to leave the four walls of their homes), yes the film is guilty of all these flaws but at least it has taken the initiative to throw light on certain aspects of a crucial, contentious issue in a commercial venture with the potential to reach large sections of the masses. Unfortunately, that intention and all its positives are completely overshadowed by its cringe-worthy keenness to bow and scrape before the present government and its head, an aspect of the film that lingers as much as its pluses because all the obsequiousness is packed into the latter half. What should have been a paean to the potty has ended up being a dishonest paean to Modi. It may as well have been named Toilet: Ek Toady Ki Katha. 1.5 stars, you are kidding me.